Haggling is an art form, a trick of the tongue. There’s nothing more satisfying than talking your way into a great deal. Sadly, modern life doesn’t leave much room for argument when it comes to prices. 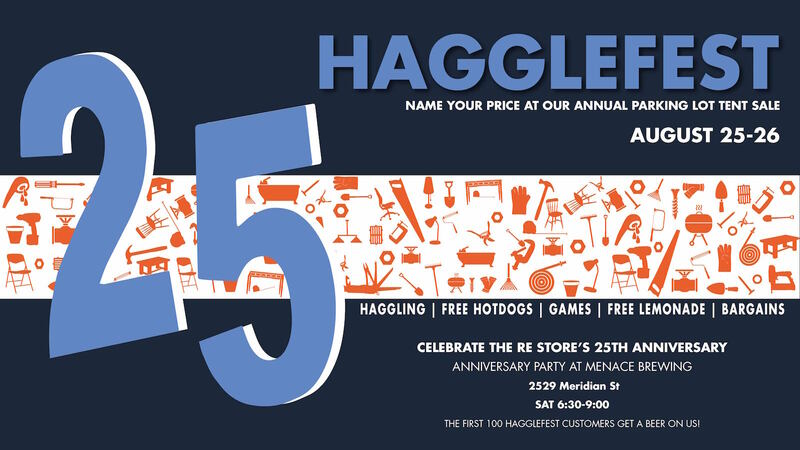 On August 25th & 26th we’re bringing back our annual Hagglefest tent sale just in time for our 25th anniversary! We’re celebrating with a tent full of items to haggle for, free hot dogs and lemonade, and some homemade games for the kids. After you’ve made your deals, be sure to join us from 6:30-9:00 on Saturday for the after party at Menace Brewing. We will be having an informal birthday party at Menace to celebrate the community that has made the RE Store possible. The first 100 Hagglefest customers will receive a ticket for a beer on us at the party. Hagglefest is great opportunity for us to make space for new donations and have a little fun with our customers. While the whole store isn’t on sale, anything in the tent is fair game. So grab your wallet and your best bargaining outfit and get ready to make a deal. When: August 25th & 26th, Saturday 9am-6pm, Sunday 10am-5pm. What: Join us for an informal get together at Menace Brewing in celebration of our 25th anniversary.